Join the discussion forum to ask questions, make comments, vote in polls, rate your favourite tequilas or simply meet other tequila aficionados. Don Pedro Sanches de Tagle, Marquis of Altamira, known today the 'father of tequila,' established the very first tequila factory in his Hacienda Cuisillos, in 1600, cultivating the local agave for distillation . He arrived in Jalisco in 1600, and the early taxation of mezcal wines prove production began very early. Over the next centuries, mezcal was used for everything from generating taxes to curing illness. There is a step in the production of alcohol that is outside the control of the humans who so carefully manage every other stage. It is almost magical, in that it occurs even without our intervention. That step is fermentation. In technical terms, fermentation is the conversion of sugars (and-or carbohydrates) to alcohol by yeast in anerobic (non-oxygen) conditions. 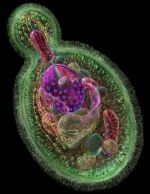 But that doesn't begin to capture the magic, or the relationship between humans and the microscopic plants (actually a fungus) called yeast. Humans have been controlling fermentation for at least 8,000 years. Archeological evidence shows winemaking was being done in Georgia in 6,000 BCE. The Babylonians did it, the ancient Egyptians did it, even the pre-Hispanic Mexicans did it as far back as 2,000 BCE. 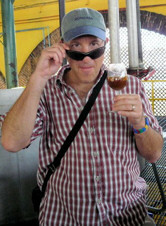 Fermentation has been used for many purposes, but for this site, our interest lies in brewing. 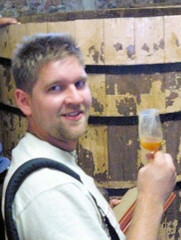 The first step to make tequila is to brew the agave juices - called the mosto (must, or wort). This is very similar to making beer, and the final product is a low-alcohol liquid at 4-5% alcohol content. Yeasts are funny creatures: a plant that seems willing to sacrifice itself for our benefit. They can take the sugars and carbohydrates and, through various enzymatic processes, turn them into alcohol as a waste product. Yeast reproduces asexually by budding- splitting off little daughter cells, analogous to the cloning of the blue agave itself. Yeastscan live and grow both with or without oxygen, where most micro-organisms can only do one or the other. Normal fermentation has two stages. The first is aerobic, where oxygen is present. This initial process is very rapid process, and the yeast doubled its colony size every four hours. This part normally lasts 24-48 hours. The second part is anaerobic (no oxygen present). This is a slower activity during which the yeast focuses on converting sugar to alcohol rather that increasing the number of yeast cells. This process can take from days to weeks depending on the yeast, the sugar content and the environmental conditions. In warm weather (68°-86°F - 20°-30°C) fermentation takes 2-5 days. But in colder weather it can take as long as 12 days. The final stage is called zymase reduction. In this step, the yeast turns acetaldehyde (glycerol) into ethyl alcohol. But at the same time, this alcohol destroys the enzymes and can kill the yeast cell if it accumulated to high concentrations. The typical brewers' yeast used by most tequila producers will start dying off if the wort reaches 5% or 6% alcohol. Brewer's yeast tolerates up to about 5% alcohol. Beyond this alcohol level the yeast cannot continue fermentation. Wine yeast, which is not used in tequila production, can tolerate a range of 10-15%, and sake yeasts can tolerate even higher percentages. There are even specially cultured strains of yeast such as Tokay and Sauterne, which can withstand alcohol levels up to 21% under the proper conditions. Fermentation has other limits such as temperature. Greater than 27°C kills the yeast less and than 15°C results in yeast activity which is too slow. Too high an amount of sugar in the solution can prevent fermentation. 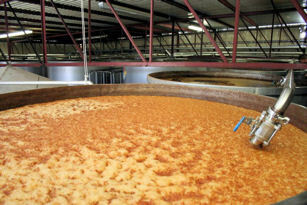 Some beer brewers' recipes suggest adding the sugar in parts throughout fermentation rather that all at the beginning if the brew is aimed at producing a high level of alcohol. Fermentation has a limited range of temperatures for best efficiency. Too cold and it slows down; too hot and the yeast starts to die off. Fermentation also produces its own heat. In the central region of Mexico, where daytime temperatures can easily reach 33-35C, producers have to be careful that their worts don't overheat. that may be one reason many companies use large, stainless steel tanks of up to 100,00 litres capacity, for fermentation. A large body of liquid will not heat or cool as quickly as a smaller one. 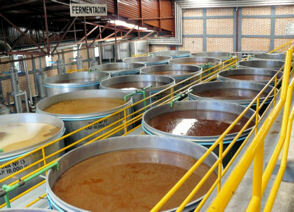 The basic requirements for fermentation are yeast, water and the juices of the cooked agave. Nothing more is necessary. The basic liquid is called the mosto (must or wort) or tepache. The juice extraction process plays a role in the concentration of sugars in the mosto. Many producers use modern crushing machines that squeeze the cooked agave fibres and rinse them with water up to four times, to extract the most juice possible. Traditional producers using the tahona (millstone or grinding wheel) simply add water to the crushed fibres to drain off the juices. The wort is sprinkled with yeast. Traditionally this is a yeast that grows naturally on the leaves of the plant, but today it may be a cultivated form of that wild yeast or even a commercial brewer's yeast (natural fermentation from airborne yeasts is sometimes allowed in some traditional tequilas, and in mezcals and pulque). "Selected in the Antilles from sugar cane molasses and well adapted to cane juice, this strain is used for the batch production of beverages from vegetal substrates (rum, aguardiente, tequila, pisco). DANSTIL 493 EDV provides organoleptic smoothness to beverages while respecting the substrate's sensory qualities. It also supports the synthesis of ethyl esters of short chains fatty acids, the reduction of amylic and isoamylic alcohol concentrations and the reduction of aldehydes." Tequila Herradura boasts it is the only company that uses 'natural fermentation.' However, according to a story in the Wall Street Journal (May, 1999) when natural yeasts are used in fermentation, some distillers must add antibiotics to kill unwanted microbes that result. Natural fermentation means allowing the airborne yeasts and bacteria to ferment the wort, without adding any other yeasts. Because these fermentation vats are open to the air, they also likely receive airborne quantities of the bacteria, Zymomonas mobilis, which lives on the skin of the agave plants. Zymomonas species are perhaps the most important alcoholic fermenters of the bacterial group in plant saps and juices, and are integral to the fermentation of agave syrup into pulque. Zymomonas are "facultative anaerobes" with both respiratory and fermenting capabilities. As in the fermentation process with yeast, Zymomonas turn acetaldehyde and subsequently into ethyl alcohol (ethanol). 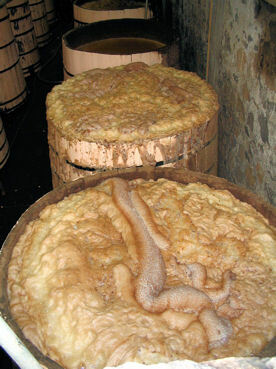 Zymomonas fermentation has a characteristic fruity odour that contributes to the odour and taste of wines. Yeast produces many other compounds during fermentation, including esters, fusel alcohols, ketones, various phenolics and fatty acids. Esters produce the fruity notes in beer, phenols cause the spicy and sometimes medicinal notes. Diacetyl is a ketone that gives a butter or butterscotch note, but it is unstable and can produces stale, raunchy tones due to oxidation as the must ages. Fusel alcohols are heavier molecular weight alcohols and are a major contributor to hangovers. Fatty acids also tend to oxidize in old must and produce off-flavors. 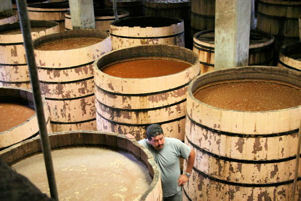 The must (mosto) is left to ferment in wooden or stainless steel tanks. This can naturally take seven to 12 days, but modern plants add chemicals to accelerate yeast growth so fermentation only takes two to three days. Longer fermentation results in a more robust body. Fermented must may also be used as a starter mixture for the next batch. Sometimes the must is fermented with some of the residual pulp from crushing the piñas. This is left in the tanks to to impart the most flavour to the liquid - another traditional practice - but more often the pulp is disposed of. It may be sold to construction firms for adding to bricks or as packing material, but it can also be composted. There is also a potential but under-utilized market for paper and textiles using these agave fibres. 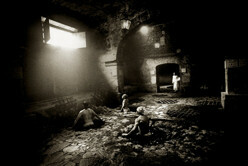 Before modernization, it was common practice for workers to get into the fermentation tank and mix the juices with the fibres. The fermenting tubs were nicknamed 'tina de lavado' - washtubs. The workers are batidores - beaters. This is rarely done today, but is still practiced in some smaller or more traditional operations like La Alteña (El Tapatio). Some manufacturers use cane sugar or the more traditional brown sugar cones (piloncillo, which can still be purchased in many Mexican markets today) to speed fermentation or to be able to use immature or fewer plants. This type of tequila is mixto, can be sold in bulk for shipping out of the country, and can be bottled anywhere, including other countries where the regulations regarding agave content are not necessarily maintained. These tequilas will not be labelled 100% agave, which purists demand. After fermentation is finished, the must may be left another 12 hours to richen and settle before distillation. There are two main schools of thought about yeast in tequila production. 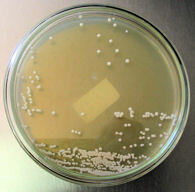 Some companies use commercial brewers' yeast. Others cultivate existing yeast and save it for future batches. This may have started as a wild or natural yeast. All open tanks are subject to being invaded by wild air-borne yeasts, so the final fermentation is the result of several strains, not just one. Some companies have cultivate yeasts in storage for summer and winter production, some for each season. Fresh and cooked agave, Drosophila spp., processing equipment, agave molasses, agave extract, and fermenting must at a traditional tequila distillery (Herradura, Amatitan, Jalisco, México) were studied to gain insight on the origin of yeasts involved in a natural tequila fermentations. Five yeast communities were identified. Fresh agave contained a diverse mycobiota dominated by Clavispora lusitaniae and an endemic species, Metschnikowia agaveae. Drosophila spp. from around or inside the distillery yielded typical fruit yeasts, in particular Hanseniaspora spp., Pichia kluyveri, and Candida krusei. Schizosaccharomyces pombe prevailed in molasses. Cooked agave and extract had a considerable diversity of species, but included Saccharomyces cerevisiae. Fermenting juice underwent a gradual reduction in yeast heterogeneity. Torulaspora delbrueckii, Kluyveromyces marxianus, and Hanseniaspora spp. progressively ceded the way to S. cerevisiae, Zygosaccharomyces bailii, Candida milleri, and Brettanomyces spp. With the exception of Pichia membranaefaciens, which was shared by all communities, little overlap existed. That separation was even more manifest when species were divided into distinguishable biotypes based on morphology or physiology. It is concluded that crushing equipment and must holding tanks are the main source of significant inoculum for the fermentation process. Drosophila species appear to serve as internal vectors. Proximity to fruit trees probably contributes to maintaining a substantial Drosophila community, but the yeasts found in the distillery exhibit very little similarity to those found in adjacent vegetation. Interactions involving killer toxins had no apparent direct effects on the yeast community structure. The water quality can also affect the tequila. Many producers have their own water source, including natural springs or wells. 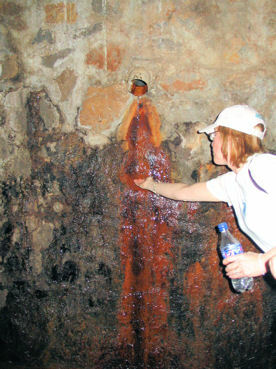 The naturally occurring minerals in these springs may have an additional effect, including acting as catalysts in the distillation. Some producers depend on water brought from outside (usually by truck), which may include the mountains surrounding the Tequila valley as the source. Water is also a necessity: agave sugars must be diluted in order for the yeast to ferment them. A level of 14-15% is optimum. Much higher and the yeasts won't work their magic. 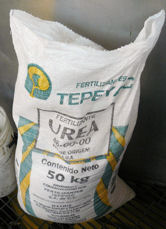 Some producers use chemical fertilizers (for nitrogen) and urea to accelerate yeast growth. Typically this involves moving the yeast into starter tanks that are increasingly larger as the process develops and the yeast population grows. High sugar requires more nitrogen for efficient conversion of the sugars to alcohol, and the mosto cannot supply it, therefore an external source is required. In the fermentation process of tequila, the type of yeast strain, the temperature (30 or 35°C) and the C/N ratio (62 or 188) had a significant influence in the level of higher alcohols produced. On the contrary, other parameters like nitrogen source [urea or (NH)SO] and inoculum amount (5% or 10%), have little or no influence on the production of the compounds responsible for some of the organoleptic properties of tequila. C/N is carbon-nitrogen ratio and organoleptic means "relating to perception by a sensory organ or involving the use of sense organs." So the report says these additives do not affect the resulting tequila. More traditional producers use smaller, wooden tanks for fermentation and depend on either air-borne yeasts to start fermentation or on yeast cultivated and stored from previous batches. These yeasts may have a lineage several decades old, spanning generations of families of producers. Still others use the spent wort which has been fully fermented and the yeasts have gone dormant, to start a new batch. In some companies, the cultivated yeasts are derived from natural yeasts found on the agave plant itself (any yeasts on the plant are killed during cooking, so the biologists and technicians must scrape the leaves to get yeast samples to grow). Some depend on air-borne yeasts in a similar manner to beer makers who produce lambic beers (these yeasts are wild variants of the cultivated yeasts used in commercial beer production). Airborne yeasts are also likely to invade the mosto in almost every distillery, given the open nature of the fermentation areas. The two main byproducts of fermentation are carbon dioxide and alcohol. The carbon dioxide is released as a gas, but tends not to rise very quickly, so it helps keep the alcohol from evaporating by forming a 'cap' on the tanks. During fermentation, the tanks get warm from the chemical reactions, and can bubble quite violently. You can sometimes touch a fermenting tank and feel the action, like a baby kicking in its mother's womb. Some are even noisy enough to hear. At the Espolon factory (Destiladora San Nicolas), in Los Altos, engineers pipe classical music into the fermentation room. Cirilo Oropeza y Hernandez, the plant manager, explained the music helped enhance yeast growth. "Yeast sways to the rhythm of music." It is concluded that crushing equipment and must holding tanks are the main source of significant inoculum for the fermentation process. "...the complexity of flavour compounds production in tequila, where both yeast strain and nitrogen source played a fundamental role. These results confirmed that different yeast strains could produce different flavour quality and, therefore, Tequila industry could use different starter cultures for different type of products." The amount and type of yeasts involved in fermentation thus may affect the final product. The result of fermentation is a liquid with about 5-7% alcohol optimally, although conditions and temperatures can make this lower, from 1% to 4%. The higher the sugar content, the more alcohol a batch will produce. The fermenting wort taste a little like sour beer. Using this knowledge, the scientists described a spectroscope test that can chemically distinguish high from low-quality tequila in two minutes. Mexico recently concluded an agreement to ship tequila in bulk to the USA, and the test should help assure that tequilas bottled in the states will be as pure as their Mexican counterparts.